How to send your designs to manufacturers and get your clothing made. Article covers – the fashion design process of a clothing line and garment manufacturing. I’m always asked the question by new fashion designers about how they can send their fashion sketches to manufacturers etc. Many times new designers do not understand the proper method of how garments are made. It is important that aspiring fashion designers understand the process. I will devote this article to talking about the fashion design process, how to get clothing made by garment factories and how fashion design software can make life easier. The Fashion Design Process works like this. First, a designer has a vision for a garment. He or she may hand sketch it out a little to get the idea on paper. Others may use a fashion designer program from the beginning to create their fashion sketch. Some of these systems even include fashion design templates. For the hand sketching designer – the next step would be to transfer the hand sketch to a computer version. This can be done by using a Fashion Design Software Program like Digital Fashion Pro. You can either totally remake the sketch on computer or scan it in and trace it. Also check out list of 4 awesome items that can help you with launching your own clothing line. This next part is important. You must know what you are trying to accomplish to proceed. If you are a home sewer, you may be looking for software that makes patterns that you can print. In reality, the next step prior to thinking about patterns is your technical sketch. Once you have your basic computer drafted sketch, you will want to turn it into a technical sketch. A technical sketch is where you actually map out the measurements right on top of the sketch. If you aren’t good with measurements, a couple of different measurement resources like The Specifications (Spec) Hand Book located in our StartingAClothingLine.com Store for Fashion Entrepreneurs. Plus you can get The Fashion Business Center – to get spec sheet templates and grading sheet templates. Now once you have your technical sketches and regular sketches saved as JPEG, PDF or PNG, you are now ready to go to the next step. Before I go on, I must stress the importance of computer created sketches. For one reason they look professional and your seamstress, pattern maker or manufacturer will be able to create your garments with better accuracy. Don’t forget you need to do a spec chart to go along with your sketches. By the way, we also offer sourcing to get your clothing samples made, production runs, button making, fashion design services and more. When it comes to designing your own clothing line – a Fashion Software like Digital Fashion Pro can help you go from Beginner to Pro. 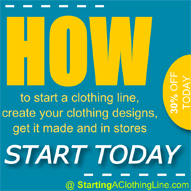 The Official Step by Step Guide to Starting a Clothing Line is a good book that will show you how to do your spec charts and how to proceed with getting your clothing made. The book also covers how to work with apparel manufacturers which is very important. I’ve personally worked with many manufacturers from all over the world and I remember the days when I would send hand sketches and the quality of the garments suffered. When we finally switched to sketches created with Fashion Design Software – our quality went up and our manufacturers were pleased with how the sketches looked. They told me that many new designers send hand sketches, but that they preferred computer drafted sketches. Also remember that clothing manufacturers mostly need flat sketches that show all the angles (mainly front and back view). For a list of factories that can make your line see our Ultimate Fashion Contact List. Okay, let’s get back to the next step. Once you have your regular sketch, technical sketch and your spec chart (full garment tech package) – you are ready for the next phase because completing these items are the foundation for making patterns, samples and production. You can even buy pattern making software if you wish so you can cut and sew your own patterns. Another option is to just send your full garment tech package without an actual cut-out pattern to your clothing manufacturer, seamstress or pattern maker and let them make your pattern or finished garment for you. Many fashion companies take this road. I find that most new designers get hung up on patterns. After 15 years in the business, I’ve learned that in the beginning stages, you really don’t know what the perfect pattern / fit for your garment is. You have to go through trial and error to get to the perfect fit prior to finalizing your master patterns. Understanding specs first should be the first stop for any new designer. Leave the pattern making to the professionals unless you are a home sewer. Get help with this entire process with our Clothing Line Creator Package. Most garment manufactures just need a full garment tech pack as mentioned above and from there they can create a sample garment for you. Most manufactures don’t need your pattern. It is not mandatory. This is an important detail for aspiring fashion designers to know because there is a lot of misconception out there on this. Trying to focus on getting patterns made to early will cost you way more money than you need to be spending in the early stages. If you are sending actual patterns to them, they will still will mostly rely on your technical sketches and spec chart. That is simply how the business works. Read more on how to get your clothing line made. Now once your garment factory / clothing manufacturer has developed a successful pattern and fit that you like – they will then go off that pattern. You can even ask them to send you a copy of the pattern. There is one exception to this rule. If you garment idea is truly complicated, you may need to have a local seamstress make it for you so that you can send it to your manufacturer. This will ensure they get it right. Still remember that your full garment tech pack must accompany the sample that you are sending them. Many new designers think that just because they send their clothing manufacturer an actual garment that the manufacturer can automatically take the measurements from it and make it. In reality, sometimes they can but most of the time they will still get the measurements wrong. So remember, nothing substitutes having technical sketches and your specification chart. Another thing to think about is how you will transmit your files to your manufacturer. It is very easy to just E-mail your computer created fashion sketches to your manufacturer as JPEGs etc. You will save money this way. Imagine every time you created a new pattern, trying to physically mail it to your manufacturer in China etc. It could get costly and time consuming. If you aren’t a home sewer, expensive pattern making services and software is a step you can skip at first. Your real focus should be on creating the best computer sketches you can create with Fashion Design Software. Another reason why you should use Fashion Design Software like Digital Fashion Pro to create your fashion sketches is because all of the big companies use design software. You don’t want to look like an amateur. If you look at catalogs from most fashion companies, you will find computer created sketches being displayed whenever they aren’t using real clothing shots. Fashion Design Software is good for creating catalogs, storyboards, portfolios, and more. In the new age of technology, fashion design software is a must! There are some affordable choices available. The price range mainly is from $249 all they way up to $3,000 and more. Digital Fashion Pro is one of the best choices because of how user friendly and easy it is to use for professional fashion designers and beginners alike. Microsoft Windows Users and Apple Mac Users can design clothing with it. At $349 for the Industry Edition, Digital Fashion Pro is one of the best choices because it creates realistic fashion sketches using Digital Fabric. That’s a nice feature because it helps people visual more accurately what your designs are going to look like once their made. Another plus about Digital Fashion Pro is you don’t have to know how to draw to create professional fashion sketches. You can also change, manipulate and fully customize any clothing templates in this the system to make them your own. Therefore, no matter what fashion design software you go with, you will find that they make life easier and more efficient. Take your time to learn the programs and you’ll find you’ll be a digital design master in no time. Don’t be left in the Stone Age. Read the 10 steps to how to start a clothing line. Also check out our article on starting a clothing line from scratch. 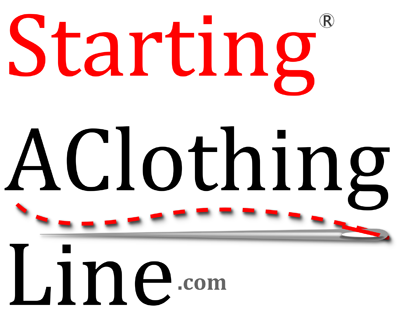 www.Startingaclothingline.com is a web site specializing in resources that help ordinary people become fashion designers and start their own fashion lines. FYI: Manufacturers need your tech pack to make your clothing. Your tech pack mostly consist of regular sketch, technical sketch, spec sheet and any related labeling for any style. Many times new designer think they need a pattern. This is not true. Real example: Say you are working with a manufacturer outside of your state or country. Tech packs are mostly sent electronically. If you have a pattern you need to say mail to 3 or 4 manufacturers – the shipping cost could get high. In reality, most lines send a electronic tech pack to get the ball rolling and proceed from there. See one of our packages to get everything you need to get your clothing made.